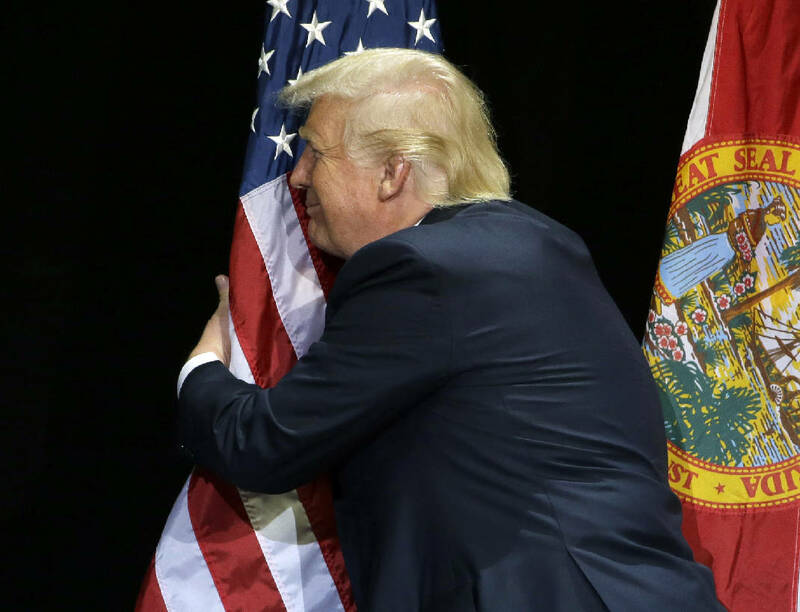 Then candidate 45 hugging US flag at campaign rally (remember, he’s the anti-Midas, everything he touches turns to crap), Tampa, FL, June 11, 2016. (Chris O’Meara/AP, Times Free Press). I’m changing it up a bit this weekend. With so much focus on the apocalypse that is 45 and his band of greedy, racist, misogynistic, Islamophobia, and Russia-helping yes-men, I have something goofy and meaningful to say. There are already several comprehensive syllabi on Donald J. Trump out, though, so adding my scholarly musings and sources to this almost inexhaustible topic would be a futile exercise. Instead, I have a mix tape (sort of), one that highlights the changes in my music tastes over time and a group of songs that I mostly despise. Just like I loath most of America’s knee-jerk arguments over 45 and his minions from the past two years. 1. “Little Lies” (Fleetwood Mac, 1987). From their Tango In The Night album. Christine McVie sounds like a shot dog on this song (and Lindsey Buckingham doesn’t sound much better). But this was a Top-5 hit on Billboard in 1987, around the same time Trump was likely being turned by Vladimir Putin and the KGB in the former USSR. And, the song’s theme is pretty obvious. 3. “Spies Like Us” (Paul McCartney, 1985-86). Proof positive that Baby Boomers will vote for anything, this piece of poop was a Top-10 hit in January 1986. It’s also emblematic of the theme of ineptitude and macabre humor that runs through the song, representing the movie by the same title, and Flynn, Kushner, Carter Page, Roger Stone, and the rest of the monolithic bloc of 45’s White men. 4. “Russians” (Sting, 1985-86). Why? Because Russians (maybe with the exception of Josef Stalin and Putin) “love their children too” — didn’t you know? But they love messing with our corrupt democracy even more. 5. “Oops!…I Did It Again” (Britney Spears, 2000). God, I have no idea why anyone would’ve ever liked this zit-popper. But the then-eighteen-year-old Spears was prescient with the line “I’m not that innocent.” Neither is 45. He made be a narcissistic buffoon who can’t put two coherent sentences together with a pen, two pieces of paper, Scotch tape, and a flashlight. But he knows where his money’s coming from, no? 6. “Just A Friend” (really, “Jus’ a Friend,” Biz Markie, 1989-90). Same theme as Britney Spears’, with a twist of crossover appeal, a ridiculous baroque get-up, and off-key singing that could only be topped by NBA Hall-of-Famer (and internalized racist) Charles Barkley. But it captures perfectly the love affair between ditto-headed supremacist Americans and 45 (it doesn’t go the other way, of course). 8. “Stranger In Moscow” (Michael Jackson, 1996-97). Jackson’s introspective song applies here as well, because, well, he uses Russia and the theme of isolation throughout. Except in 45’s case, he likes it that way. And apparently, so does Russia. 9. “Lies” (En Vogue, 1990). Trust me, it fits! (s/o to Dawn Robinson). Supporters and sycophants beware: 45 is coming for you, in a steamroller with a 700-horsepower engine going one hundred. 11. “Fake Love” (Drake, 2017). I’m a Aubrey Graham fan. I can’t stand Drake. Still, this release from More Life should be required listening from 45 supporters who think they’re not racist, misogynistic, xenophobic, or narcissistic. He also has a song on this album titled “Portland,” though I seriously doubt he was thinking about this weekend or Richard Collins III. 12. “Waterfalls” (TLC, 1995). Yep, yep, yep. Both 45 and MAGA-types have been chasing illusory rainbows and torrents off jagged edges, and damning everyone who they perceive as a threat along the way. And they’re both on a one-way trip. 13. “Don’t Forget Me When I’m Gone” (Glass Tiger, 1986). This is the song 45 should play whenever he finally leaves office, whether by resignation, impeachment, and/or force. As everything 45 touches turns into crap, Glass Tiger’s Top-10 schlock cannot be made any worse. Plus, not even Glass Tiger would complain about 45 using their crappy music. 14. (Bonus Track) “No Bravery” (James Blunt, 2006). 45 is part of a continuum, one that stretches through all of American history. On the international stage, though, it has been one of constant chest-thumping while killing innocents in the name of freedom or national security. Though Blunt’s was about fighting for the UK, the song has much more applicability in the US. We have so much blood on our hands, and 45 means to add to this fetid river on the domestic and international frThe #45 Mix Tapeonts.